Japan Arts as original, as well as the culture of this country. Going on tour in Japan, you can not deny yourself the pleasure to see traditional Japanese theater, or visit the presentation of contemporary artists. 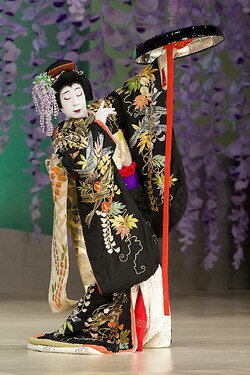 Japanese classical theater has two directions – Noh and Kabuki theater. But theater has existed for seven centuries, and during that time he was little changed. Today we can see the representation of the theater, but the way he saw our ancestors. At the heart of the highly theatrical art are the symbols associated with the Shinto religion. The ancient religious rituals by a symbolic display turned into a theatrical performance, which is always full of deep philosophy. 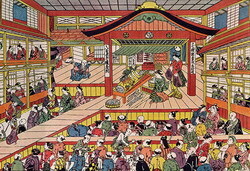 Even a theater stage, but similar to the interior of a Shinto temple. Theatre connoisseurs but we believe that the best views are on the spacious grounds of the temple, but not limited to the theatrical stage. But the theater is characterized by rich costumes, made from luxurious fabrics with precious finishes and original decorations. Actors on stage depict scenes of the play, to use the language of sounds, gestures, facial expressions. Mandatory attribute views are masks on the faces of the actors that carry a deep meaning. in the Kansai region, Osaka (theater Nogaku Kaikan). This kind of theatrical art is a drama theater with centuries-old traditions and foundations.Performances are always accompanied by a wealth of scenery and luxury of acting suits. The actors do not wear masks, but replaces the abundant makeup, which was indistinguishable faces of people. 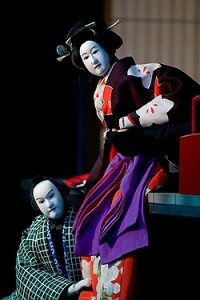 Performances include a lot of dynamic and emotional moments – battles on samurai swords, flying, jealousy and despair. in other regions while touring theater companies. Another view of the Japanese Bunraku theater is – Puppet Theatre. The puppet shows involving dolls, which is 3/4 the size of human growth. To manage such a doll requires just three master puppeteers. Submitted doll made of wood and forfora, and each is a work of art. During the presentation of plays Japanese traditional instrument – shamisen. in the Kansai region, Osaka (National Bunraku theater). 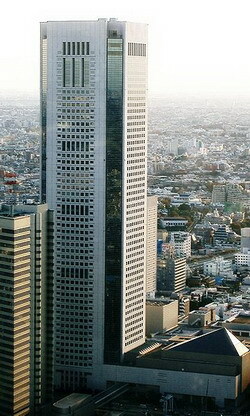 In Japan, it released many kinds of contemporary performing arts, many of which are not represented anywhere else in the world. In scenes of urban theater hosts numerous performances, musicals and concerts. The Japanese love the ballet and opera. In Tokyo, the year-round posters are full of well-known names such as Japanese artists and guests from abroad. 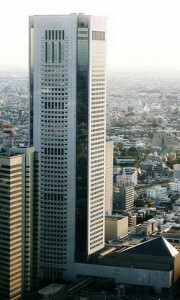 The biggest stars give performances in Tokyo Opera City . Original concerts, which are recommended to go to are the performances of such groups as the Japanese Takarazuka ensemble composed entirely of girls and gives a very interesting presentation, and Butoh dance theater, featuring modern interpretation of classical dance.